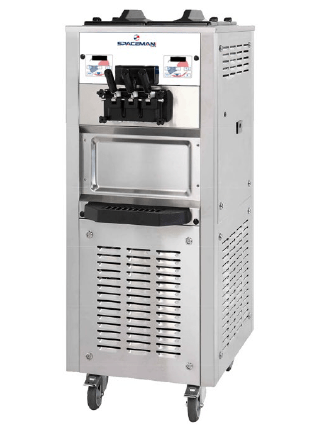 To choose the best frozen yogurt machine which are generally the same as a soft serve ice cream machine, you should have a good understanding of what equipment and options there are available. The only difference between frozen yogurt and ice cream production depends on configuration of the machine, including whether you use an air pump/pressurized system or gravity fed system. Air pumps are generally used for soft serve ice cream in order to increase the overrun on the product, which creates a lighter, creamier ice cream texture. Franchises also use air pump to increase the volume of product that is dispensed, a portion of which is air – air is free! Once you consider and research the above points, you are ready to make an educated choice on what the best frozen yogurt machine is for your application. Keep in mind that soft serve frozen yogurt machines like mentioned above come in different models, and they all serve different purposes. Cleaning the best frozen yogurt machine is very important and will increase the life of your machine, routine cleaning and maintenance will also allow you to produce better, creamier product, and decrease likely hood of service visits. It not only keeps the machine clean, but also helps improve the way your machine operates. Quarterly wearable part replacement is suggested in order to keep your machine clean and operating smoothly. If wearable parts are not replaced often enough they will begin to crack which leads to leaking and bacteria growth. When it comes to cleaning, we can provide proper training so that you can always clean your soft serve yogurt machine correctly. Different frozen yogurt machines have different warranties. Before you buy a machine, consult with your supplier about the warranty of the machine. Some last a year, others 3 years, and so on. Labor warranties are also recommended for new machines, as it eliminates any stress or concern about the covered period costs for manufacturer related issues. We have a great selector tool to help you to choose the best frozen yogurt machine for your shop, when you are ready. We are here to help, and always a phone call away to answer questions or provide any information you may need in order to make the right choice.